Cook pasta according to package directions. Drain, then set aside. While pasta is cooking, heat butter in a medium skillet over medium heat (300 degrees in an electric skillet). Add onion and cook until tender. Add cooked pasta, salmon, tomato, lemon juice, parsley and salt. Cook until heated through. 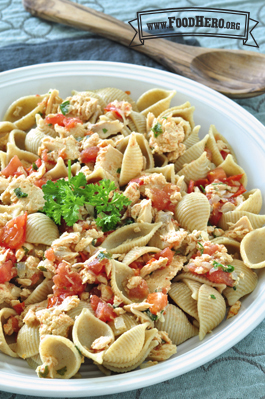 1 Comments for "Salmon Pasta Skillet"
Wow, this is GREAT! We tried it with canned salmon once and found out the family doesn't like that so much. BUT when we tried it with tuna it was a huge hit with everyone who liked tuna. So yummy. And low-cost but seems really fancy :).